Fresh Japanese Udon Noodles in Seattle! For fresh noodles delivered in Seattle daily look no further than our partner Caviar where you can order anything off our menu and have it delivered directly to your door. Noodles, soups, spring rolls, tempura dishes including eggplant, mushrooms, crab or Kabocha Squash, crispy tofu, Karaage chicken ( which is basically Japanese fried chicken ), sweet potato, and much, much more. Check out the menu on Caviar for photos and ideas. Delivery should be between 12-25 minutes or so. Definitely give us feedback as to how those deliveries are working out as well. We’d really appreciate that. 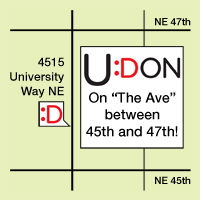 U:Don Fresh Japanese Noodle Station is a pair of Seattle restaurants specializing in serving fresh, house-made udon noodles cooked to order and delivered in a fast, entertaining, and interactive fashion. Our guests can watch the udon noodles being made, as they customize their meal with freshly prepared toppings and sides to their preference. Lunch and dinner available daily. 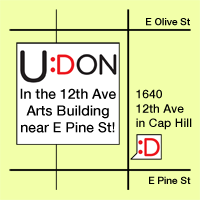 Our second U:Don Noodle Station is located in the heart of Seattle’s Capitol Hill near the corner of 12th and E Pine streets, in the new 12th Avenue Arts Building. We have an expanded noodle menu that includes new and unique udon noodle styles and side items, along with all our signature and most popular dishes served at our flagship U-District store. Plus beer and sake! How tasty does that sound, Seattle? See you there, and bring your appetite! Taste our amazing noodle specials at U:Don! Try our hand-made Sanuki udon in two new chilled styles for a little variety. For the spicy food lovers! Chilled fresh udon noodles served on a zaru mat with our signature sesame dipping sauce, sliced green onions, and a spicy Tan Tan pork on the side.